Da Couch Tomato: Game of Thrones. Episode 3: "Lord Snow"
"Rest assured, sir, I will not be the comic relief in this series." Along with Arya Stark, this is my other favorite character. 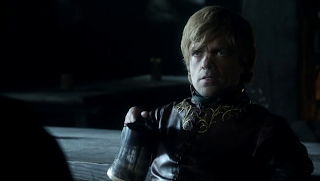 Tyrion Lannister. The dwarf. Played by Peter Dinklage. This is actually the first instance where I've seen a midget do a serious role. Updates for this episode: Bran has woken up, of course. But with slight amnesia. Ned Stark is already at King's Landing. Jon Snow is now at the Wall. Daenerys Targaryen is with child, and is slowly becoming a queen. And... Arya Stark is now learning how to fight with swords. Can't wait for that day.